The US has reworded a draft UN resolution on war-ravaged Darfur to rally support for pressure on Sudan, accused of backing Arab militias there. The new text does not mention the word "sanctions" against Khartoum, even though it maintains the threat. 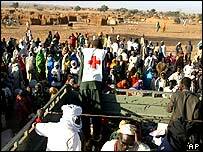 A spokesman for an aid agency in Darfur said the draft was a delay when tough action was needed immediately. The US says hundreds of people are dying every day because of the Sudanese government's failure to act. But the aid agency spokesman - who wished to remain anonymous - said the changed US resolution appeared set "to let the government off the hook". Sudan denies backing the Janjaweed Arab militia blamed for the violence. More than one million people have fled their homes in western Darfur region. An estimated 2.2m people are in urgent need of food or medical attention. Almost 200,000 people have sought refuge in neighbouring Chad. UN Secretary General Kofi Annan has made an urgent appeal to the leaders of European, Asian and Gulf nations to give more money to ease the humanitarian crisis. The UN said it had received less than half of the $349m in aid it requested in March. Mr Annan is taking part in talks with 11 African heads of state in Ghana - designed to try to end three of the continent's conflicts. The secretary general was trying to use it to make progress on the crisis in Darfur. The US ambassador to the UN said a vote on the new - fourth - draft of the US resolution would be taken on Friday. Although it no longer mentions the word "sanctions" the new text implicitly maintains their imposition unless the Sudanese government reins in the Janjaweed Arab militia within 30 days. It calls on Mr Annan to report every 30 days "and expresses its intention to consider further actions, including measures as provided for in Article 41 of the [UN] Charter on the Government of Sudan in the event of non-compliance". US Ambassador John Danforth said the new text was not a weakening of the draft - simply "UN speak" had replaced the word "sanctions". Article 41 refers to "measures not involving the use of armed force" to enforce decisions. These measures include "complete or partial interruption of economic relations and of rail, sea, air, postal, telegraphic, radio, and other means of communication, and the severance of diplomatic relations". Seven Security Council members - Pakistan, China, Russia, Algeria, Angola, the Philippines and Brazil - had pushed for the reference to sanctions to be removed because they believe Khartoum needs more time to act. Mr Danforth said the US hoped the resolution would receive unanimous support. The US, he said, was not interested in punishing Sudan - simply forcing its government to carry out its responsibilities on Darfur. "The UN says it is still receiving reports of rapes and killings in the Darfur region"